Our Classic 2 Inch Faux Wood Blinds offers a FREE "Cornice Style"
valance upgrade. Accent your window blinds with our crown valance designed to sit outside your window frame on inside mount blinds. These are our best value faux blinds for sale. Made from the highest quality and competitively priced, our classic faux wood blinds are an excellent choice. How does the Cornice style Valance mount if the blinds are inside mounted? The valance is attached to the head rail with valance clips that pushes the valance outside the window frame. The cornice style aka returns will either be clipped on to the valance or glued on. So, what are they made of? Just wondering if they clean easily, since real wood is difficult to clean. Also for the free blind offer do they all have to be the same size? They are made with vinyl Faux Wood. They're very easy to clean, you'd just need a duster. For the buy 3 get 1 free you can mix and match any sizes. The lowest priced item will be free. Is the Bright White a piano finish or does the man-made material have texture of wood grain? 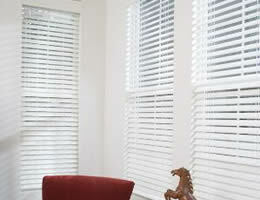 Any of the faux wood blinds that say sandblasted or embossed will have a textured finish except for the Platinum blinds. The Platinum bright white is smooth. Confused regarding the free cornice. Am looking at the Classic 2" Faux wood and the Aspen 2" Faux wood blinds. Do they both come with a free Cornice? I will be ordering for inside a window with no frame around the window. Please let me know and I will order soon. Both of these faux wood blinds come with a free valance. Each product has the option to select the "cornice style" valance that will sit on the outside of the window opening. Otherwise they will come with a valance that has straight cuts on each end and will fit inside the opening of your window. I have no complaint. This was the second time I ordered blinds from Blinds Chalet, and am extremely happy with them. I would recommend Blinds Chalet. New blinds look great. Really finishes off the look for new windows. All the blinds were received at the correct size and included all the parts needed for install. Installation was quick after finishing the first one. Installed five in about 2 hours. The function of the cords is simple with no loops or multiple strings to get tangled. The white tape vertically to cover the cords through the blinds gives them a clean look. Overall, extremely satisfied with this purchase from Blinds Chalet! Hi,everything was fine just one of blind was wrong size! Excellent service....all my emails were answered promptly.. Excellent service....all my emails were answered promptly.. the product is excatly as described!!! The valance was a little difficult for me, by myself to install, but I figured it out. The valance was a little difficult for me, by myself to install, but I figured it out. Love my blinds!!! And the valance gives it the perfect finishing touch!